Manyverse is a social network mobile app with features you would expect: posts, threads, likes, profiles, etc. But it's not running in the cloud owned by a company, instead, your friends' posts and all your social data live entirely in your phone. This way, even when you're offline, you can scroll, read anything, and even write posts and like content! When your phone is back online, it syncs the latest updates directly with your friends' phones, through a shared local Wi-Fi or on the internet. 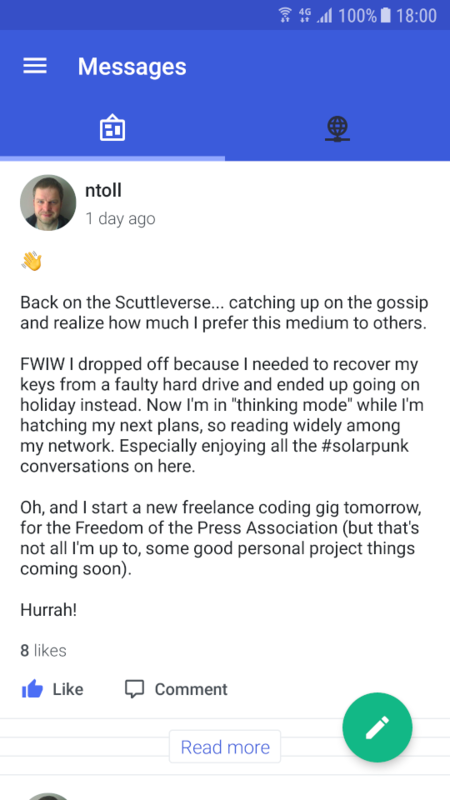 We're building this free and open source project as a community effort because we believe in non-commercial, neutral, and fair mobile communication for everyone. No token. No ICO. No blockchain. No tracking. No spying. No analytics. No tedious registration. No premium costs. No annoying notifications, emails, and banners. Scuttlebutt is the most fun part of the Internet for me. It feels like living in the future. It has a melange of different groups and cultures all acting together towards building a beautiful community. I love it. Besides the warm and honest and diverse and funny community, Scuttlebutt has the most collaborative gang of software developers in the known universe. This is just the beginning. We have many more features planned in the roadmap, but we will need your help to get there. Read our blog to keep up with updates to this project! The Manyverse app is open source software licensed as Mozilla Public License 2.0. The manyver.se website is licensed as Creative Commons BY-SA 4.0, created by Andre Staltz.